SAN DIEGO (CNS) — A group of students from the University of San Diego recently spent their spring break in Mexico — but not to party. As participants in the “Tijuana Spring Breakthrough,” an annual offering of the Catholic school’s campus ministry program, the 15 traveled across the border to accompany and learn from their less privileged peers. “We use the language of immersion,” explained Julia Campagna, a campus minister who was one of two staff coordinators who joined the students March 1-7. With the emphasis on accompaniment and solidarity rather than service, the program offers participants an opportunity to be with people as they go about their daily routines in the hope that they recognize the human faces behind hot-button issues that dominate the news. Throughout the week, the students had opportunities for group discussion and reflection. Austin Gunderson, 21, was among this year’s participants. “I wanted to challenge myself to . . . step out of my comfort zone and try something new that really turned out to be an amazing experience,” he told The Southern Cross, newspaper of the Diocese of San Diego. Kaia Hubbard, also 21, had been invited by friends to a popular Mexican tourist spot. Instead, she opted for the service program. “I felt that this was an opportunity that I really wouldn’t have at another time in life . . . and something that I didn’t want to pass up for a more traditional spring break,” Hubbard said. For much of their week, the students slept in sleeping bags in catechism classrooms at St. Eugene de Mazenod Parish, which is administered by the Missionary Oblates of Mary Immaculate. However, for one 48-hour period, they were sent in pairs to live in the homes of host families from the parish and to join them in whatever they would be doing, such as attending Mass or a family gathering. At the prospect of living with a host family, Gunderson was “a little bit nervous and timid at first.” But his anxiety disappeared as he found himself developing “an authentic relationship” with his hosts. Yet, she said, they opened their homes, provided “incredible meals” and shared their personal stories. The students also visited Casa del Migrante, or Home of Migrants, a shelter run by Scalabrinian missionaries for men who have been deported from or are seeking asylum in the United States. On two occasions, they had dinner with its residents, among whom was a man who had made his way from Ghana to Brazil and, through the swamps and forests of Central America, to Tijuana. They also interacted with the residents of Albergue Las Memorias, a hospice and shelter for adults and minors with HIV/AIDS, and heard a member of the organization DREAMer Moms tell the story of her deportation from the U.S. eight years ago and the pain of being unable to see her daughter. Other stops included the office of Ollin Calli, a collective that promotes labor rights for factory workers; the San Ysidro Port of Entry, one of the busiest land border crossings in the world; and Parque de la Amistad in Playas, or Friendship Park, the beach where a U.S.-built border fence runs out into the surf. Hubbard noted that from the beach one can see the Coronado Bridge and the San Diego skyline. She describes the beach visit as one of the moments that “changed something or flipped some switch” for her. “I thought about all the times I had driven over the Coronado Bridge, or I’d had a fun beach day or something like that, and I hadn’t even realized that there are people living 30 minutes south who are experiencing things that I have never even worried about,” she said. The students also spent an evening with the parish’s vibrant youth group, reflecting with them on the meaning of Lent, joining them in eucharistic adoration, and accepting their invitation to a parish-wide celebration with food and dancing. 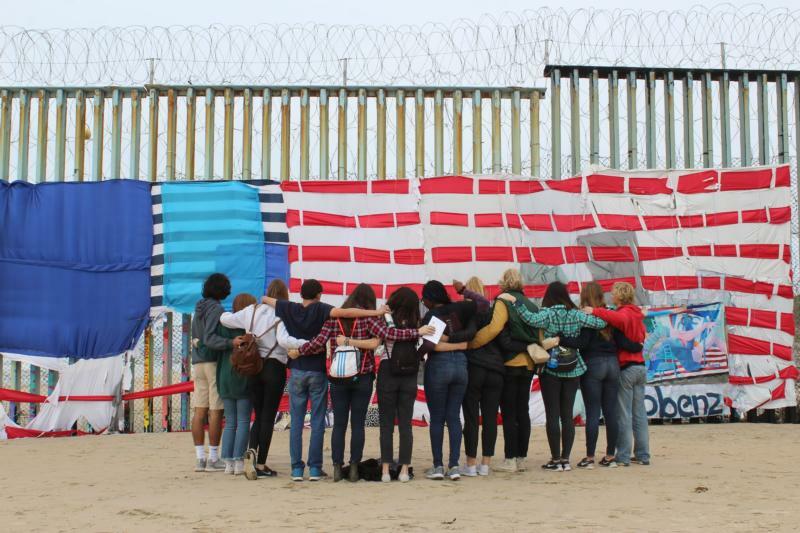 The trip ended with a stop on the U.S. side of the border at Chicano Park in a Mexican-American neighborhood of San Diego that is known for the ornate murals that celebrate its cultural heritage. The spring tour is one of four under university’s “Romero Immersion Program,” named in honor of St. Oscar Romero, the Salvadoran archbishop who was martyred for his social justice advocacy. The other three are Tijuana day trips and immersion programs in East Los Angeles and downtown San Diego. Gunderson, who has led and participated in Tijuana day trips, said he returned with greater awareness and an increased spirit of generosity.